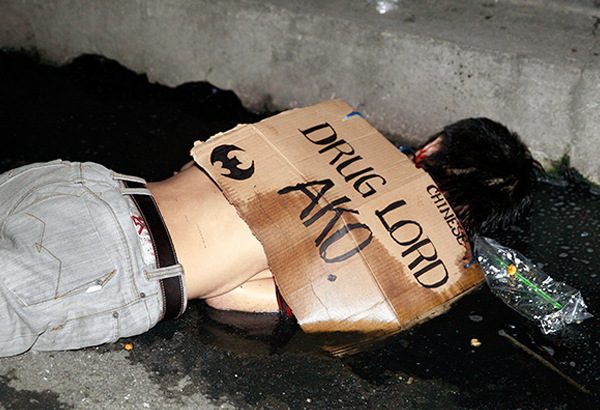 MANILA, Philippines - Amid a growing call to investigate alleged vigilante killings, Philippine National Police (PNP) chief Director Ronald “Bato” dela Rosa said drug rings, and not vigilante groups, are responsible for summary executions of drug users and dealers on Tuesday, April 16. During a command conference at Camp Crame, dela Rosa said intelligence reports show drug rings have direct links to the murdered suspects. He said everyone will be surprised once they release their data. "Alleged vigilante killings turned out to be syndicated killings ng mga grupo sa droga (by drug groups),” dela Rosa said. Since President Rodrigo Duterte took oath in the office in June 30, hundreds of suspected drug peddlers and users have been murdered. An independent tally carried out by the ABS-CBN Investigative and Research Group revealed at least 1,036 drug suspects were killed between May 10 and August 12. According to their data. 625 died in police operations while 318 were murdered by by unidentified assailants and 93 salvage victims were recovered away from the crime scene. Dela Rosa has earlier dismissed accusations of police involvement in vigilante killings. He alleged convicted drug lords of ordering hit men to slay distributors who had difficulties in remitting earnings after the Duterte administration magnified its campaign against illegal drugs in the country. “You keep on looking at the police, you keep on suspecting us. But those behind these ‘salvage’ … these are the work of drug syndicates,” Dela Rosa said last month. The Senate committee on justice is set to conduct a hearing regarding the issue on August 22 and 23. In a report by CNN Philippines on Friday, August 12, PNP Directorate for Investigation and Detective Management Executive Officer Senior Supt. Fausto Manzanilla said that it may take some time until the data on the alleged summary killings are released. He added that probing such killings will be difficult since there are no witnesses nor complainants willing to cooperate.